Once a utilitarian space separated from the rest of the house, this newly renovated St. Louis kitchen evolved into an open and airy hub of activity. After enduring a two-year remodeling odyssey of major demolitions, Alex and Melissa Garza quite literally watched their dream home emerge from a pile of rubble. Transplants from Falls Church, Virginia, the couple had scoured the St. Louis listings for months before landing on the one — built, as it turns out, decades ago on a large secluded lot by renowned modernist architect Harris Armstrong. “He was well ahead of his time when it came to a home’s efficiency and having the design blend into the natural surroundings,” says Alex, “so we tried to honor his work in everything we did to the house, including the kitchen — keep it clean and simple, yet elegant, with lots of storage, clean lines and natural materials,” he adds. With three boys to feed, the couple knew they’d be spending a lot of waking hours in their kitchen and wanted it to be a focal point in their home. 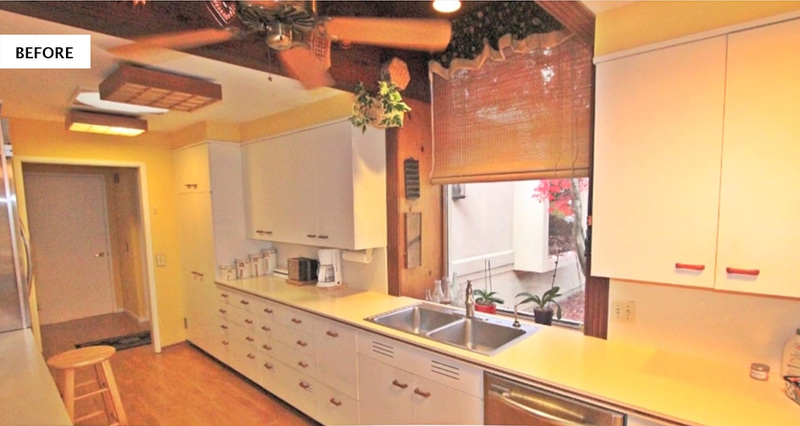 They tore down walls to create a wide-open modern floor plan with plenty of space for prep work, cooking and eating all within the same general area. “We love spending time as a family and didn’t want the kitchen walled off from the living or dining areas” notes Melissa. “The end result was an amazing open space that encourages interaction,” she says. 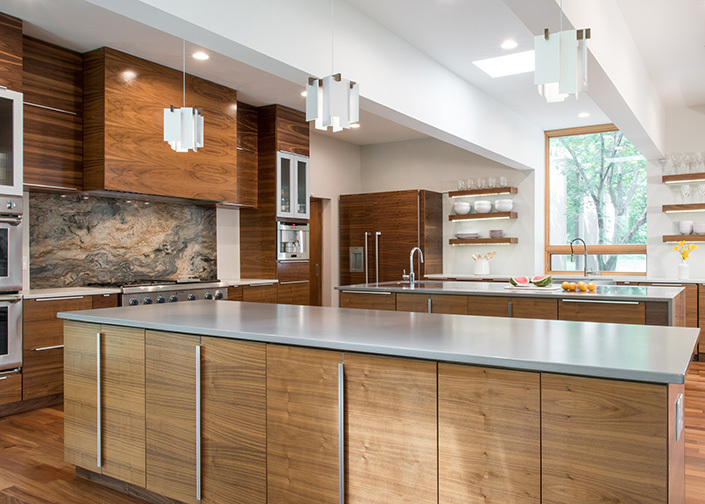 After weeks spent sifting through magazines and websites for ideas, and searching for bargains on materials, the couple began to visualize the functionality they wanted for their kitchen and the cutting-edge finishes that would pull it all together. They discovered a great deal on Craigslist for a shipment of teak flooring that Alex picked up and loaded himself in Kansas City. 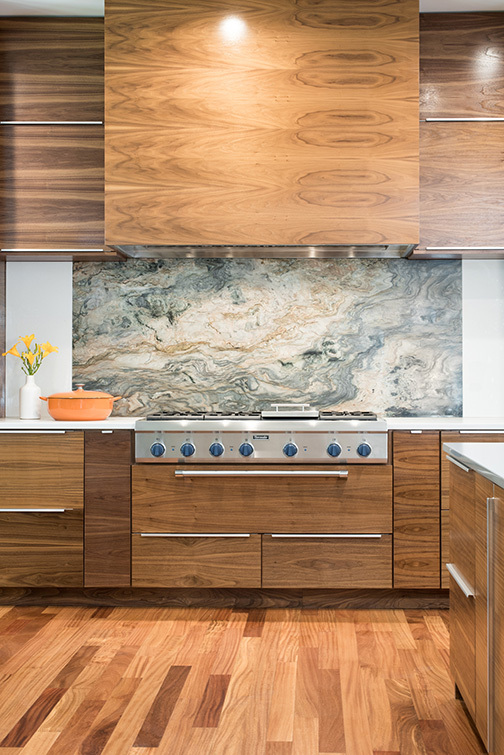 For the countertops, Melissa found a contemporary waterfall design they both fell in love with for its clean look and modern style. 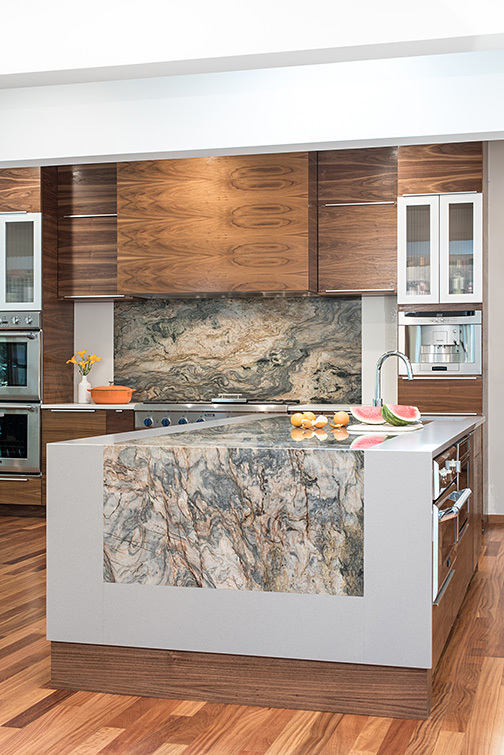 They took the design to Tony Russo, owner of Russo Stone and Tile Design, who guided them on choices of stone, border colors and how to make the perfect cuts for a seamless appearance. “My staff created a computer rendering of the completed island as Alex and Melissa had envisioned it, and I think that gave them piece of mind” says Tony. “We’ve all seen waterfall panels that go to the floor — but this one would look as though it were hanging on its own, just short of touching the floor. With a little simple engineering, we were able to secure it in a way that we felt confident it would never move or separate,” he adds. The next challenge was making a natural stone slab smoothly match up with a slightly textured Caesarstone slab. After trying a few different techniques with samples, Tony’s design team got it just right. When the day arrived for the installation, the end result turned out better than anyone expected. 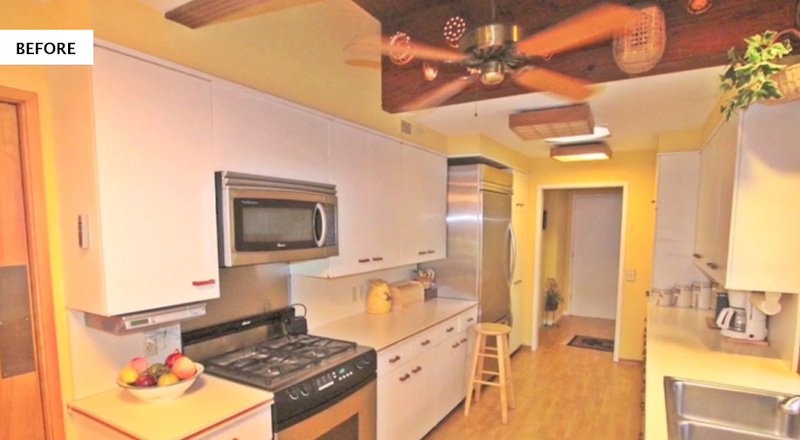 “We loved it so much we decided to use the same stone as the backsplash for the stove top,” says Alex. “To us, those stones are works of art more than they are utilitarian pieces,” he adds.